AMC has the Super Bowl pregame taken care of for everybody. The Walking Dead mid-season premiere is now available to watch for AMC Premiere subscribers. Season 9 doesn't start up again until next Sunday, but AMC has gifted fans with an early release through their subscription service. If The Walking Dead fans weren't already signed up for AMC Premiere, today might be a good time to start up a trial to check it out. In addition to the announcement, AMC released a humorous Super Bowl-themed teaser. This Super Bowl teaser for The Walking Dead features Daryl (Norman Reedus), Michonne (Danai Gurira), King Ezekiel (Khary Payton), Judith Grimes (Cailey Fleming), and Carol (Melissa McBride) preparing for battle against the Whisperers, who are led by Alpha (Samantha Morton).The funny footage makes it look they're going to square-off on the football field and fans of the hit AMC show should get a kick out of it, no pun intended. Plus, it announces that they can go watch the mid-season premiere right now, ahead of the big game. This isn't the first Super Bowl-themed piece of promotion that AMC has released for The Walking Dead. This weekend saw a pre-Super Bowl party show that was hosted by Norman Reedus, Jeffrey Dean Morgan, and director/producer Greg Nicotero. The trio talked some shop and about who might be the best villain in the series. Nicotero has said in the past that Alpha is, which led to Morgan giving him a text to remind him about Negan. The director/producer admits that he has a lot of love for Morgan's Negan too, but he loves the "terrifying nature of the Whisperers." 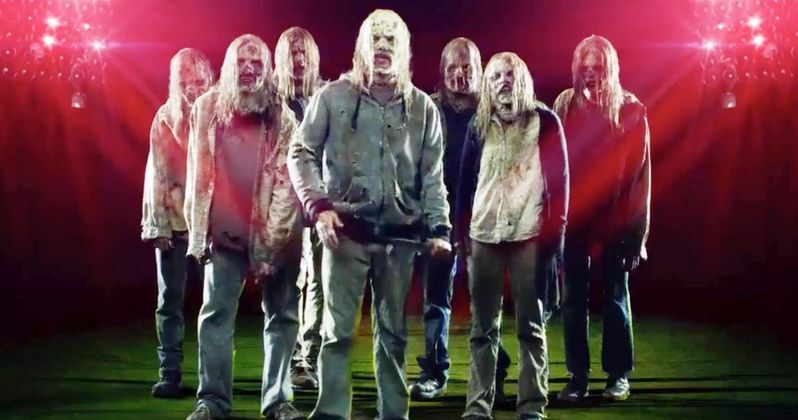 A lot of The Walking Dead fans are excited to see the Whisperers, who Jeffrey Morgan called "badass" at last year's San Diego Comic-Con. Morgan is going to see a switch, where Negan isn't the big bad during the rest of Season 9, which should be pretty interesting for all parties involved. Will Negan start to go in a different direction when the Whisperers arrive on the scene to take the villainous crown? That isn't clear at the moment, but we could all start getting hints by watch the mid-season premiere a whole week early right now. The Super Bowl is preparing to begin and AMC has gifted The Walking Dead fans with a break from the talking heads and sports broadcasters. Jordan Peele got in on the pregame fun this morning too. The director offered up the second full-length trailer for his upcoming horror movie Us, which should fit right in with fans who are looking forward to The Walking Dead Season 9 mid-season premiere. So, what are you waiting for? Put down the cheese dip and check out the first episode. Or, wait until after the game, the choice is yours. In the meantime, you can watch the Super Bowl-themed teaser below, provided by The Walking Dead Twitter account.